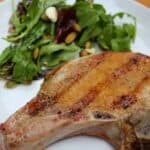 A simple yet very flavorful spice blend makes these Heaven Sent Grilled Pork Chops an easy recipe that is sure to please! Pre-heat a grill to medium high. Combine the cumin, garlic powder and salt in a small bowl. Sprinkle the rub on both sides of each pork chop, and rub it into the meat. Let the pork with the rub sit at room temperature for 10 to 15 minutes to let the flavors absorb into the meat. Spray the grill with cooking oil. Place the pork chops on the grill on direct heat. Cover and grill for 6 minutes, then turn the pork chops over to grill the other side. Grill 5 or 6 minutes more until done to your liking, taking care not to overcook it. Let the chops rest for a few minutes, then serve.